Here at Ribble Valley Recliners, we have used our vast experience to source furniture which is brand new, yet gives the look and atmosphere of a classic antique piece. All of Ancient Mariners vintage leather sofas, chairs, and other items are beautifully handcrafted using traditional village techniques. Much more than furniture, they truly represent and express quality and everlasting style. Like anything natural, Ancient Mariner furniture has a distinctive character which will only get better with age. Using vintage distressed leather, gives the appearance of a loved and cherished antique piece of furniture. 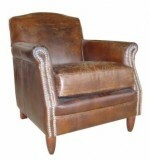 If you are searching for that antique furniture look, with vintage leather chairs and sofa’s. then look no further than the Ancient Mariner range here at Ribble Valley Recliners. Our prices are ‘Most Excellent’ and we do constantly price check the market, but please note that we will never be beaten on price!